Let’s talk a little about Crested Gecko breeding. Many new breeders or hobbyists in the Crested Gecko world will simply put any male and female together, just hoping to produce babies. There’s no rhyme or reason to the pairings and the results are generally a mix of whatever morphs are being paired. More experienced breeders will pair like animals together in an attempt to refine the traits of the parents and produce similar if not better-looking offspring. 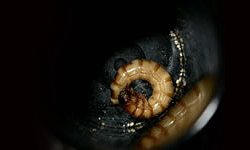 Some breeders will also engage in “line-breeding”… a practice where the female offspring are paired back to their Sire or more infrequently a male offspring back to the Dam. 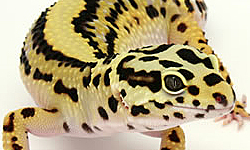 This practice can yield offspring where the desired morphs or traits are exaggerated (for example, Super Dalmatians, Pinstripes and Extreme Harlequins). While these can be produced without line-breeding animals, many of the crazy colors and patterns we see today are the result of “selective breeding”. These colors and patterns simply do not exist in the wild…. Could you image trying to hide from a predator in the lush green of New Caledonia when you are bright red? When I began breeding Crested Geckos way back in 2000, I was guilty of that beginner method where I paired a random male to a random female. Soon after, I got the bright idea to try to get as many different traits onto the offspring as possible. How cool to hatch out red pinstripes loaded with tiger stripes and Dalmatian spots! Cool indeed, except that it never worked and no one was really excited about the animals I was producing. Early on, there was a time when simple pinstripes and harlequins were selling for top dollar because few people were producing them. That’s when I learned that pairing like animals together generally produced offspring that looked like the parents. So I bought unsexed animals and raised them to adulthood, then selectively paired like animals together. Suddenly, Dragontown Reptiles was on the map and people began noticing what I was producing. The third method mentioned above (line-breeding) is something I have not engaged in. I have preferred to do bloodline swaps with other breeders, raise the animals and incorporate them into my breeding plans. This continued the method of pairing like animals and ensured that bloodlines were diverse. Yes, those are the same animals showing fired and un-fired coloration! While some people may look at the parents and wonder how they produced such offspring, the result is actually not terribly surprising. Knowing the lineage of these animals makes the resulting offspring relatively anticipated. Now this pair has produced many yellow pinstripes, exactly as expected. Some of those animals are bright yellow, some are heavily patterned and still some are more of a dull yellow with either thick full pinstripes or broken pins. Still others have no pinstripes at all. This all falls under the expected offspring umbrella, but those animals account for about 50% of the offspring. The other 50% are completely unexpected: Black Pins! I can tell you that this 50-50 ratio has proven out over three seasons and remains consistent. I just can’t tell you WHY it happens. I know the lineage of Lemonade, but I purchased Flash from someone who had no info on him. Obviously somewhere on his family tree there are some dark animals. Ah, the fun of genetics! At first glance, this looks like a beginner’s pairing of random animals. What I was hoping to achieve however made this pairing quite specific. I wanted either Yellow animals that had full cream pins (a combo of Day’s dorsal structure and her color with Night’s Cream / White dorsal) OR Black and White pins (Night’s colors with Day’s dorsal structure). Well, I got neither! Every single 2017 hatchling has matured to fire up Peach and every 2018 hatchling so far resembles every other hatchling from this pairing. Have a look at these animals! So now I know that Day comes from yellow animals and I know that Night comes from really dark animals and somehow their offspring are peach? After 18 years of breeding, surprises still abound with these amazing animals! I hope that this article points new breeders in the right direction with respect to identifying lineage and pairing like animals to achieve specific breeding goals. While that is the norm, we have also seen how these pairings can produce unexpected results and how pairing opposites has resulted in a most unexpected outcome. What’s to learn from this? There are many secrets yet to be discovered from the breeding of Crested Geckos. There are some hidden genes just waiting to be extracted and someone somewhere is going to be the very first to produce Crested geckos unlike anything yet seen in the hobby. It is already happening (Lilly Whites and Axanthics) and I believe there’s much more to come. Maybe YOU will be the next person to unlock a recessed gene! Happy breeding! Interesting stuff! There are certainly genetic rules at play, but I feel no one has made a concentrated effort to figure it all out. Information collecting of parents and resulting offspring like this is the first step. 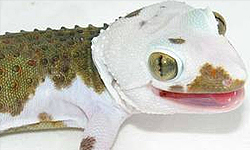 This certainly means that hue in geckoes has two codominant alleles (Yellow and White) which express together (Peach). Cool stuff!